We hope this finds you all well in the midst of the summer heat. 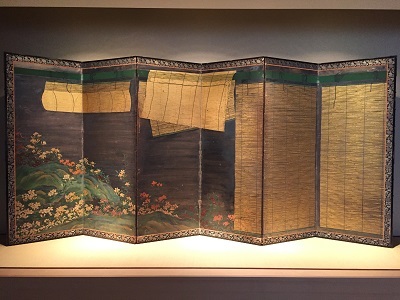 As has become tradition here, we have decided once again to display our refreshingly cool Bamboo Blinds screen in our latest summer exhibition. 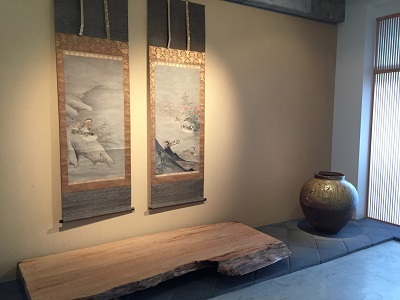 The generous application of gold pigment in rendering the bamboo gives the blind an almost three-dimensional feeling, and the apparent depth achieved with the flowery knoll in the background creates a sort of optical illusion, making it seem as if we are comfortably indoors looking beyond the blinds at a natural summer scene. In addition we have an ancient Chinese bronze, Joseon period Korean blue-and-white brush holder, and a Japanese literati landscape painting by the famed Gion Nankai (1677-1751). It is hot outside, but we hope you will take the time to come see us and cool down! ※Please note that certain exhibits will be rotated during the exhibition.